Three fishermen captured by Somali pirates say they were freed without a ransom demand once the pirates discovered they were from Sri Lanka. The fishermen told BBC Sinhala the pirates first asked if the boat was an Iranian vessel. "When we said Sri Lanka boat, they said Sri Lanka and Somalia the same, meaning both are poor countries and you don't have money," the captain said. The fishermen returned to Sri Lanka over the weekend. 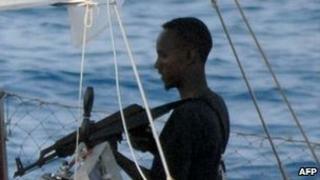 The fishermen were captured by the pirates in the Indian Ocean in late January. "Early morning one day we heard a noise and I thought it was electric short circuit but pirates were firing at us. Then five pirates came into the boat and two of us were shot," the fishing boat's captain Wasantha Priyanjith De Silva Weerasuriya told the BBC Sinhala service. Two of the fishermen were killed during the initial confrontation. The boat was then taken to Somalia. However, Mr De Silva Weerasuriya said the pirates did not demand any ransom after they found out that they were from Sri Lanka and let them return to Sri Lanka in their own boat. He also accused the Sri Lankan government of not taking any action to secure their release.